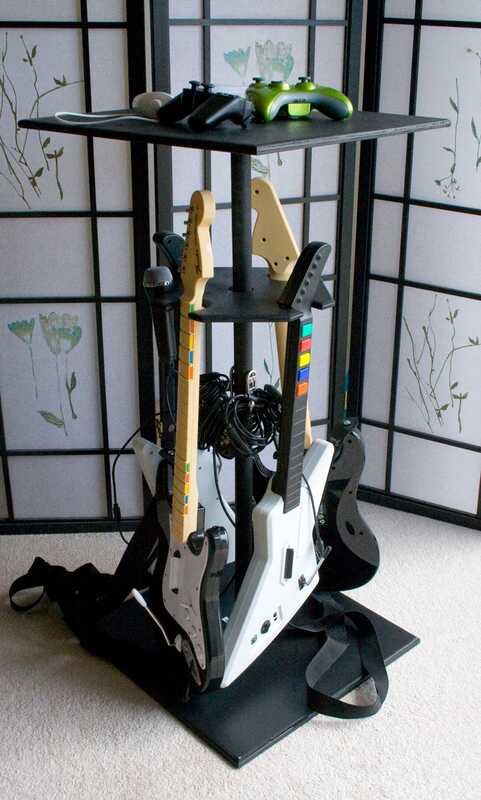 The Gadget: A wooden stand that keeps your Rock Band and Guitar Hero guitars, mic, and various controllers in check so they don't otherwise destroy your living room in a mass of plastic and cabling. The Price: $55 for the standard stand, plus $10 extra if you want extra microphone holder holes. The Verdict: It works! Propping up your guitars against this thing is much classier than leaning them against walls, cabinets, chairs, dogs or ottomans. There's even two sets of hooks on either side so you can wrap your cables around them for even more neatness. The unit comes unassembled, but the instructions are pretty clear and only required about 10-15 minutes (with an electric screwdriver) for all the screwing. The only complaint we have with the design is that the middle support rod is a rod, and thus round, and makes it hard for uncoordinated people like us to screw in everything straight. Not a huge deal, but ours ended up crooked.